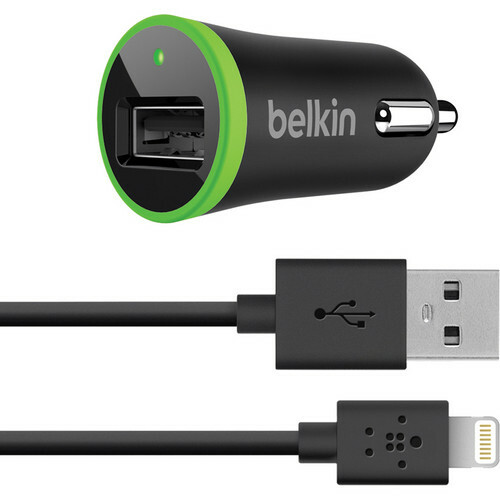 Use the Belkin Car Charger with Lightning to USB Cable to keep your devices powered up and ready to go while you're in the car. Simply plug the low-profile charger into your car's power port and it will sit flush with the dash to stay out of your way. The built-in universal USB port delivers 10 watts / 2.1 amps of power for fast charging. The Lightning connector can be flipped 180 degrees and inserted into the dock connector in either orientation. A 4' Lightning to USB cable is included for charging Lightning devices. Charge legacy Apple 30-pin or micro USB devices using the original charging cable that came with your device. Box Dimensions (LxWxH) 5.6 x 4.0 x 1.2"
Car Charger with Lightning to USB Cable (4') is rated 4.1 out of 5 by 7. Rated 5 out of 5 by MJ from Great Charger This is a great charger. Having the lightning cable separate from the plug allows you to use the plug with other USB cables. The length of the cable is long enough for use in our truck without being so long that it's always in the way. Rated 4 out of 5 by Raoul from Al what you need to keep going! :) Very good quality for the price. Have it been using on long journeys to keep my iphone charged. I use my iphone for navigation and 10W, 2.1Amp is ideal for charge the battery and let the navigation work at the same time. Rated 5 out of 5 by Seth from B & H delivered as promised The product arrived on time and everything worked out fine. Rated 1 out of 5 by soymas from Cable has deteriorated a week Cable has deteriorated a week!!!!!!!!!!!!!!!!!!!!! Rated 5 out of 5 by Bruce from It worked It worked. Yes, I have an Iphone 6S and it works great.